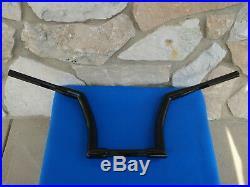 14" BLACK DNA MONSTER FAT APE HANGER BARS 1-1/2" HARLEY HANDLEBARS. Brake Calipers & Brake Pads. Turn Signals & Tail Lights. Gas Tanks & Caps Related. Swingarms & Wide Drive Kits. Front Ends DNA Wide Glide 41mm. Front End Fork Tubes 39 & 41mm. Front End Sliders & Lower Legs. Triple Trees / Fork Related. Wheel Bearings Axles & Spacers. Wheels 40 Spoke Billet Hub. Wheels 60 Spoke Billet Hub. Wheels 80 Spoke Billet Hub. Wheels DNA Fatty 40 Fat Spoke. Wheels Ultima 48 Fat spoke. Wheels Dna Mammoth 52 Fat Spoke. Notched ends for throttle-by-wire or standard throttle bikes. Bars are dimpled and drilled for wiring and handlebar controls. Most applications will require longer cables and extension of handlebar wiring (Available at most Harley dealers in Drag Specialties catalog). Height of bar is figured approximately from bottom of top of bar to bottom of bar at triple tree. 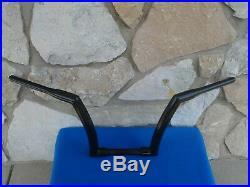 These 1 1/2" diameter bars measure 35" wide and have an approx 5-6 overall pullback. Diameter is 1 at clamping portion for Handle Bar control. Made from 1 1/2 tubing. Beautiful Black powder coated finish. Width at bottom outside: 11. Width at inside clamping: 5 1/2. Bars fit forks with riser spacing of 3 1/2 knurling on center standard on Harley. 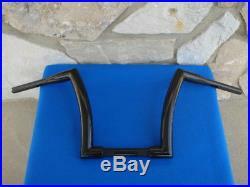 Notched ends for use with throttle-by-wire or standard throttle bikes. Will not fit Street Glide or Electra Glide or any Touring model with batwing fairing. And will also not fit 2014-later Road Glide Models. Softail Night Train EFI FXSTBI/B. Softail Street Bob FXBB : 2019. Below are photos of many other items related to the item listed above. THANK YOU FROM KCINTERNATIONAL - KCINT! WARNING Limitation of Liability: KC International Motorcycle Supply (KCInt) shall not be held liable for any damages that result from the Improper installation of parts, use, control, alteration or maintenance of motorcycles. Payments must be made in U. In some parts of the country it is illegal to receieve or use some of our products. KC International Motorcycle Supply (KCInt) is not responsible for any charges for labor, repairs, materials, down-time or lost profits due to returning any merchandise. RETURN AUTHORIZATION Before returning any item, please notify us so that we can provide you with a. And we will give you specific instructions on how to proceed with your return. To speed authorization, please provide us with the invoice number, order number, and order date when you call. The item "14 BLACK DNA MONSTER FAT APE HANGER BARS 1-1/2 HARLEY HANDLEBARS" is in sale since Monday, March 26, 2018. This item is in the category "eBay Motors\Parts & Accessories\Motorcycle Parts\Handlebars, Grips & Levers\Other Handlebars & Levers". The seller is "kcint" and is located in Dayton, Ohio. This item can be shipped to United States, Canada, United Kingdom, Denmark, Romania, Slovakia, Czech republic, Finland, Hungary, Latvia, Lithuania, Malta, Estonia, Australia, Greece, Portugal, Cyprus, Slovenia, Japan, China, Sweden, South Korea, Taiwan, South africa, Thailand, Belgium, France, Hong Kong, Ireland, Netherlands, Poland, Spain, Italy, Germany, Austria, Bahamas, Mexico, New Zealand, Philippines, Singapore, Switzerland, Norway, Saudi arabia, United arab emirates, Qatar, Kuwait, Croatia, Malaysia, Colombia, Antigua and barbuda, Aruba, Belize, Dominica, Grenada, Saint kitts and nevis, Saint lucia, Montserrat, Turks and caicos islands, Barbados, Bangladesh, Bermuda, Brunei darussalam, Bolivia, Ecuador, Egypt, French guiana, Guernsey, Gibraltar, Guadeloupe, Iceland, Jersey, Jordan, Cambodia, Cayman islands, Liechtenstein, Sri lanka, Luxembourg, Monaco, Macao, Martinique, Maldives, Nicaragua, Oman, Peru, Pakistan, Paraguay, Reunion, Viet nam.